The Voletta has arrived! This gorgeous Jenny Yoo style features a coquette chantilly lace scooped strapless lace bodice over organza and taffeta. Princess seamed bodice ensures a flattering fit. Taffeta band at empire waist defines and accentuates the narrowest part of the waist. 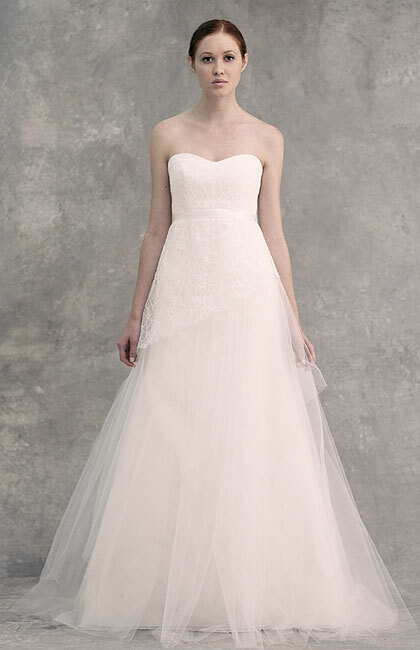 Layers of lace fall asymmetrically along a tiered tulle/organza skirt in antique white. Full length. Fully lined. $2,200.